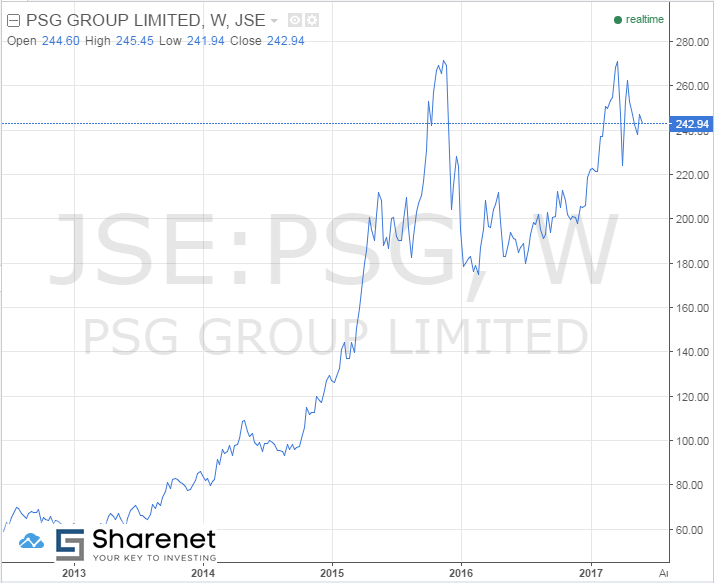 Views - PSG Group Ltd: SA's Best Success Story? PSG is probably SA’s best success story and one of the greatest success stories in the world. PSG Group listed on the JSE at the end of 1995 at a price of 35c per share. An investment in the company then would have returned a staggering 49.5% compounded annual growth rate (CAGR). To put in perspective, the JSE returned 14.4% CAGR in the same period. PSG’s underlying assets include Capitec (50%), Curro (18%), PSG Konsult (12%) and Zeder (9%). 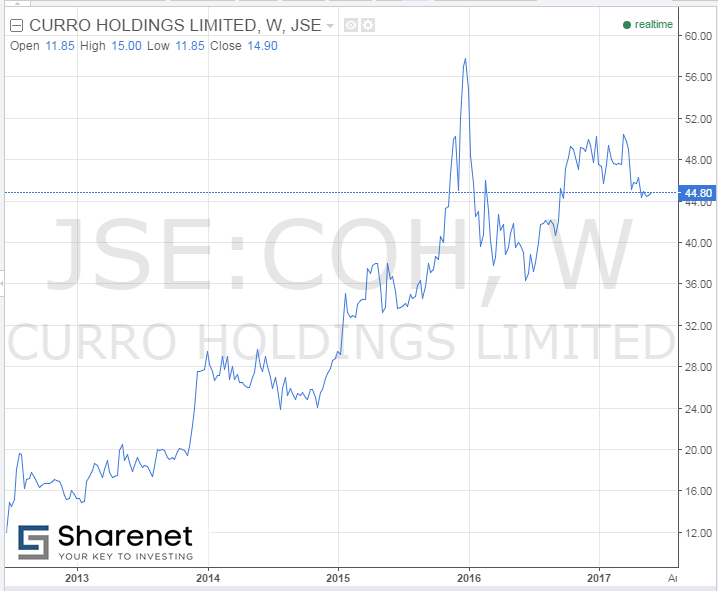 Capitec’s and Curro’s performance is the driving force behind the excessive returns that PSG returned to shareholders, even though Curro only listed in 2009. 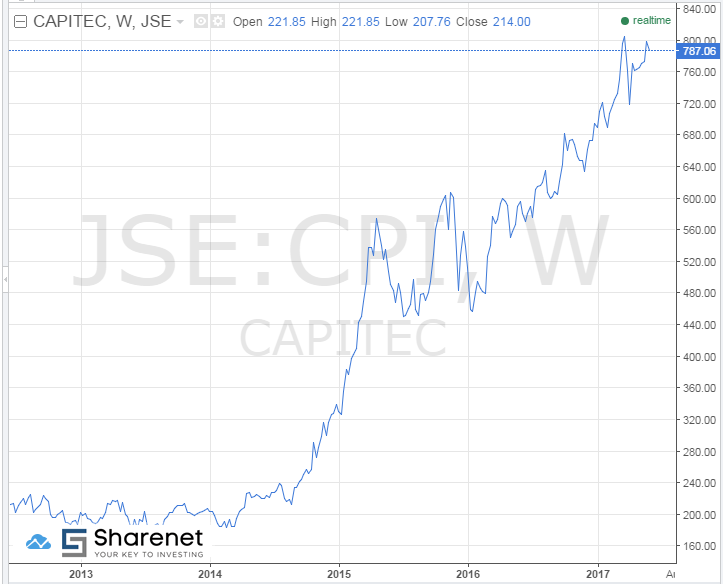 Capitec returned 54.9% CAGR since it listed on the JSE in 2002 and Curro returned a massive 74.4% since 2009. What I like the most of the PSG Group, is their long-term vision in what is needed for the future of South Africa and rest of Africa. From providing affordable private education to providing food security for a global growing population. Capitec was also a visionary quest to establish a low-cost bank for the masses. The companies which PSG are invested in, are all companies with sustainable long-term business models, and each company has the ability to provide massive growth. Capitec is one of the star performers in the banking sector. It gained 8.6 million active clients and is expected to have over 9 million clients by June 2017. Its market share is said to have reached 11% and is still growing. There is also room to grow in the higher income segment (people who earn R360�000 or more annually), which it only holds 2% of the market share. The bank is planning to gain another 9% market share to reach 20% in two years. Curro is one of the leading private schools in the country, and the most affordable private school in South Africa. The company have proved that there is a massive gap to be filled between government schools and expensive private schools. The company has grown to educate 47,589 learners in 127 schools nationwide since it was founded in 1998. The company is looking to have 79 campuses and 170 schools by the end of 2020. Curro is also making a big move in the tertiary education market, which could provide substantial growth in the coming years. 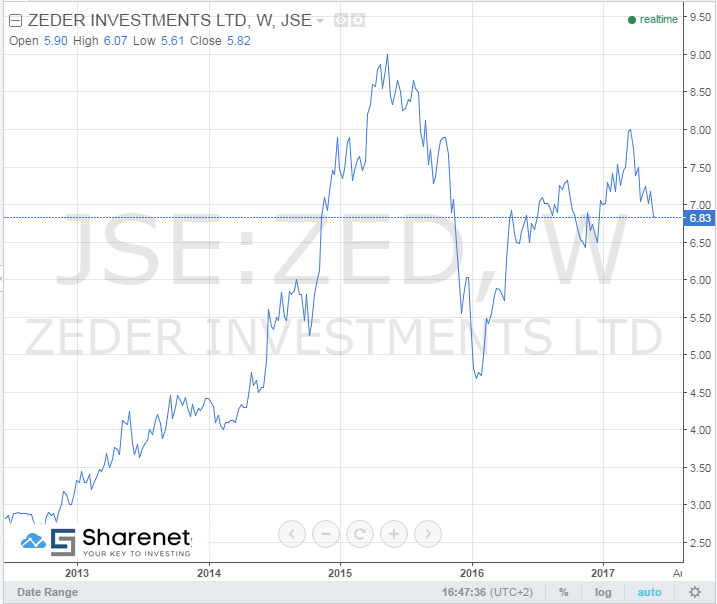 Zeder is an investment holding company that invests in the broad agricultural sector, with its main focus on the food and beverage industry. The company was started as a long-term play on the food security of a fast-growing global population. The company’s major holdings are Pioneer Foods, Capespan Group, Zaad Holdings and Kaap Agri; the last mentioned is due to list on the JSE in 2017. The company also holds an investment in Agrivision Africa, which invests in the large-scale commercial farming of staple foods in Zambia. Daniel is a full-time analyst and securities trader, and is responsible for equities research across industries. Although he grew up in a small town in the Klein Karoo, Daniel has always been interested in both locally and internationally traded companies. Daniel has been actively investing and trading on the JSE and other global exchanges since starting his Bcom Investments Degree at the University of Stellenbosch, which he completed in 2014 . During his studies, Daniel worked as an intern at Kruger International in Johannesburg in 2015, gaining valuable experience from Hein and Mia Kruger. He is currently a CFA candidate.